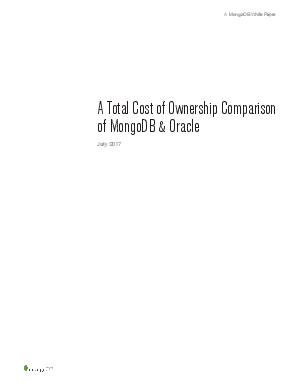 MongoDB is an open-source, document database designed with both scalability and developer agility in mind. MongoDB bridges the gap between key-value stores, which are fast and scalable, and relational databases, which have rich functionality. Instead of storing data in rows and columns as one would with a relational database, MongoDB stores JSON documents with dynamic schemas. Customers should consider three primary factors when evaluating databases: technological fit, cost, and topline implications. MongoDB's flexible and scalable data model, robust feature set, and high-performance, high-availability architecture make it suitable for a wide range of database use cases. Given that in many cases relational databases may also be a technological fit, it is helpful to consider the relative costs of each solution when evaluating which database to adopt.